Students at Presidio Middle School use the HMH iPad algebra app. As Apple pushes out its new education products, new information about whether using the iPad gives students an advantage over using print books is starting to surface. Results from Houghton Mifflin Harcourt's year-long study comparing students using the publisher's iPad algebra app are in from Amelia Earhart school in Riverside, Calif., and it's largely positive, according to the company. 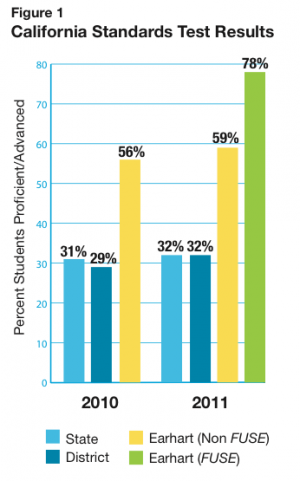 The study showed that 78 percent of students who used the HMH algebra iPad app scored "proficient" or "advanced" on the California Standards Test, compared to 59 percent of students who used the textbook version. "As students were randomly assigFuse, the results indicated that use of the app was the chief cause behind the improvement in student test scores," the report states. Students were much more motivated during class and were more interested in the subject. Changes in student learning outside of the classroom. Students reported reading more and trying to work independently outside of class when completing homework. Also, students were coming to class explaining that they had watched the video multiple times at home. MindShift covered the pilot project when it first launched last year at the Presidio Middle School in San Francisco. Algebra teacher Jeanetta Mitchell, who piloted the app in her class, said at the time that there was definitely an adjustment period and different levels of expectations, both on the part of students and administrators. She said that when the pilot first launched, test scores for the class using the iPad were actually lower than those using the traditional textbook. Read more about HMH Fuse Pilot study here.